The Omron Principles represent our unchanging, unshakeable beliefs. They are the cornerstone of our decisions and actions. The Omron Principles are what binds us together, and they are the driving force behind Omron's growth. Our Mission summarises the meaning of the phrase ‘Business should create value for society through its key practices’ - taken from the words of our founder, Kazuma Tateishi, saying, “A company is most valuable when it contributes to society beyond the simple pursuit of profits." Therefore, we pursue the creation of a society in which all people can live more comfortable lives. Our Values are the operating philosophies that guide and drive us in our daily work. 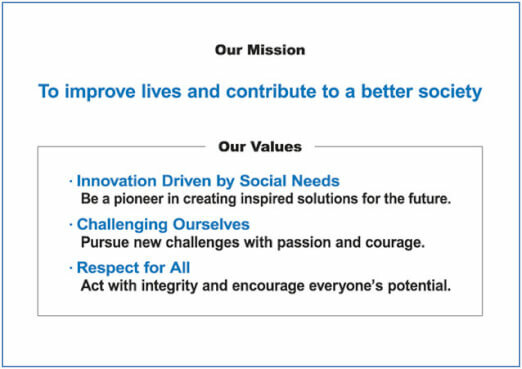 We live our Values in order to achieve our Mission.